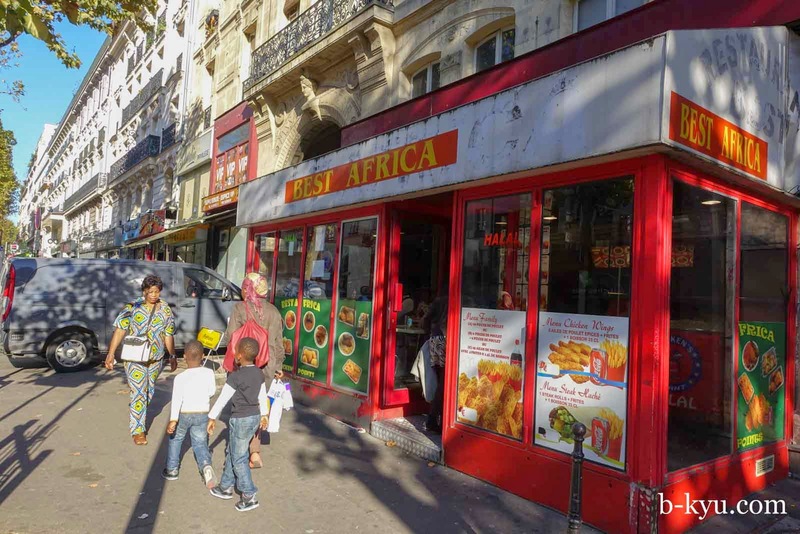 Of all things it was African food we looked forward to most on our month long stay in Paris in late 2014, in particular restaurants catering to African migrants, a rarity back home in Australia. 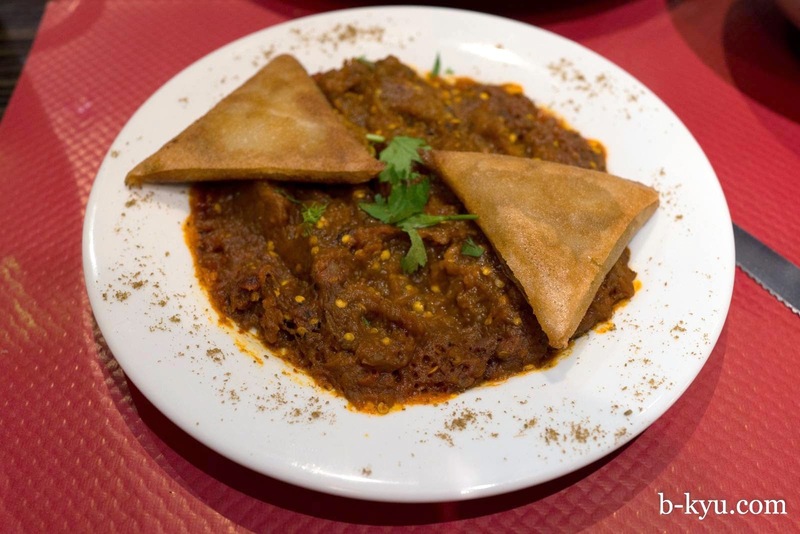 We found some great West and North African restos, but not nearly as many as we hoped. 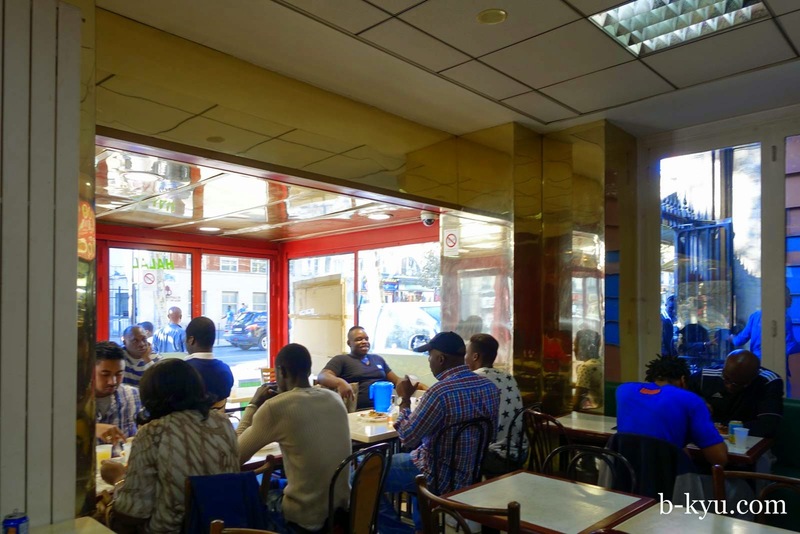 Surprisingly, considering Paris's population, African restos for African folks are quite hard to find. 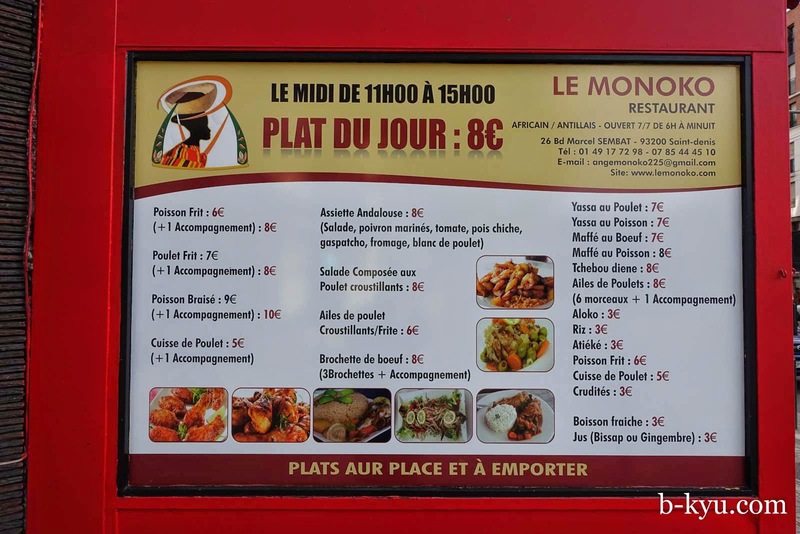 We walked every arrondisement and more and found just three West African migrant restos, and a handful of North African joints. There must be loads more, especially out in the suburbs. 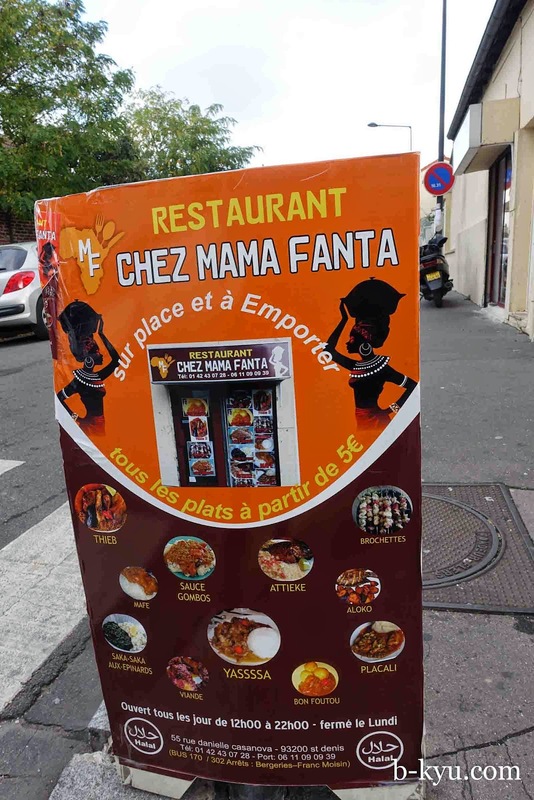 African restaurants catering to Western folks are much easier to find, with amazing cuisines from all over Africa (see Yelp), we'd love another six months in Paris to explore them. 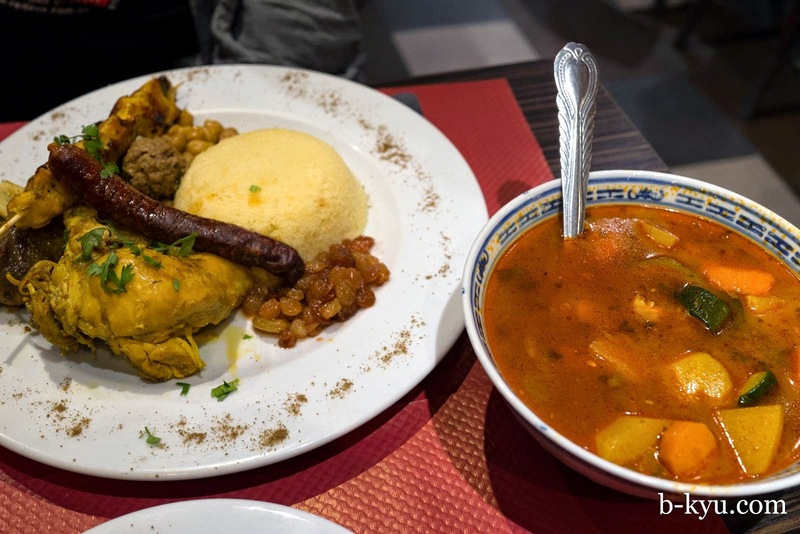 Moroccan restaurants are a category all on their own, these are pretty much as popular as say Thai restaurants in Australia, with couscous adopted as a national staple. 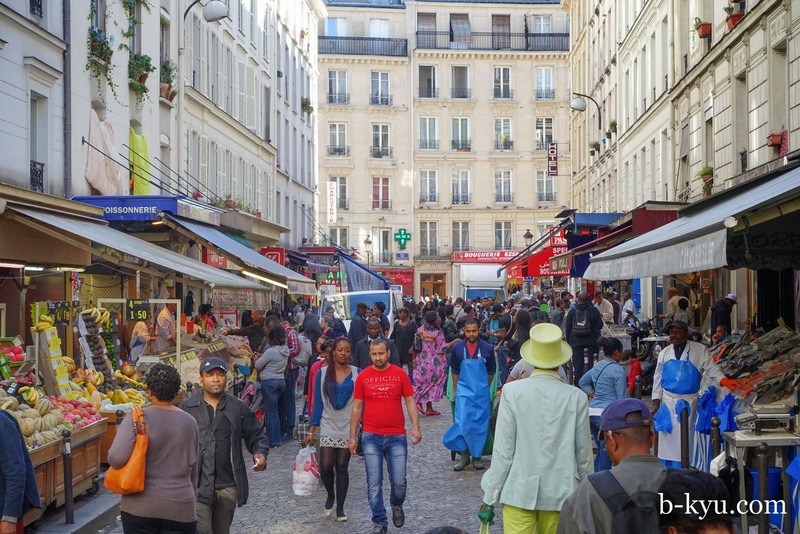 We walked several kilometres from Saint Ouen Pousse Marche back south straight down the guts of Paris, through some amazing areas packed with African folks. 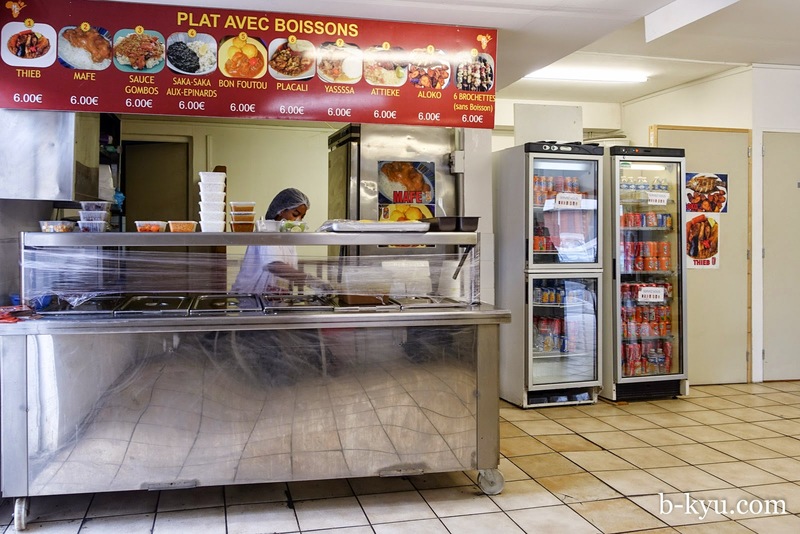 We thought there would be African migrant restos galore but we found zilch. We'd scoped out Dans Best Africa earlier. This is on Rue Doudeauville and is pretty close to the centre of Paris. 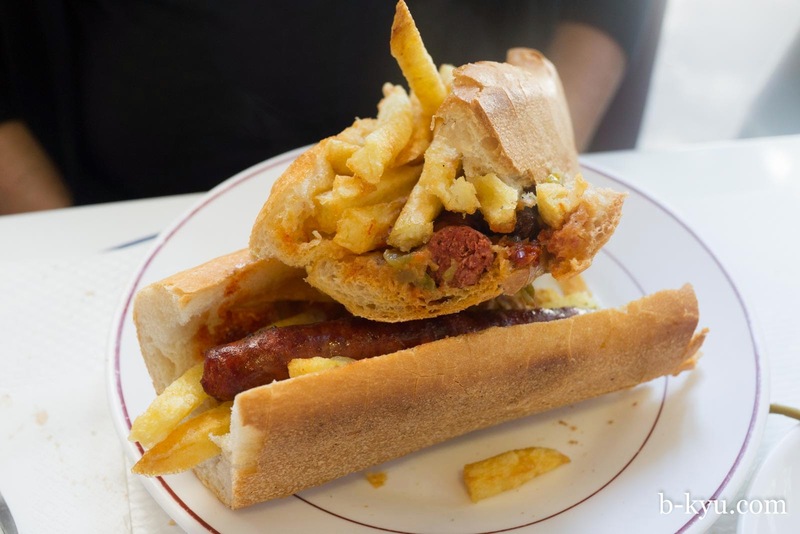 Best Africa has two menus: the burger'n'fries section seemed long defunct, but the homestyle African section was thriving. We couldn't figure out the ordering system so we did what we usually do: dive in and hope for the best. The staff were cheery and happy to explain the drill. 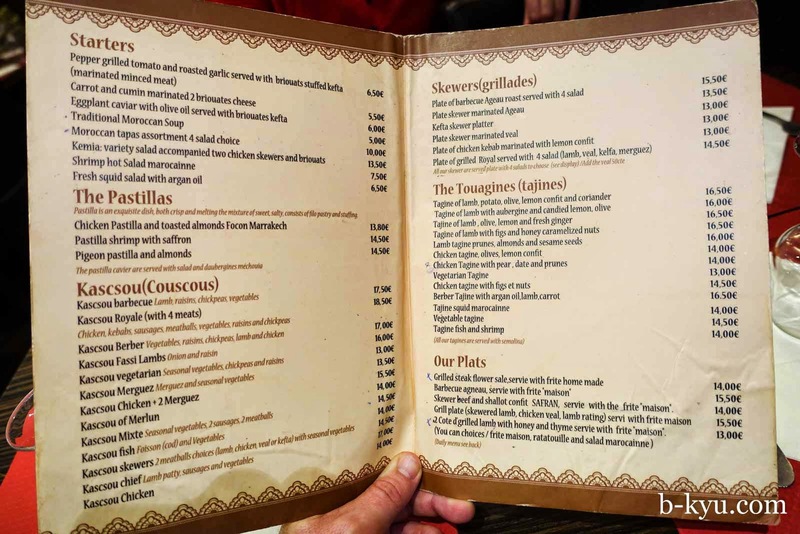 First choose your stodge: plain rice, plain couscous or red couscous. The nice lady will dollop a huge portion of your chosen stodge on a plate. Nice lady will then ask if you want banana, spelt banane, pronounced 'bananee'. The correct answer is 'yes'. The banane is little chunks of banana, sweet but not as sweet as regular bananas, deep fried and crunchy. Mama. 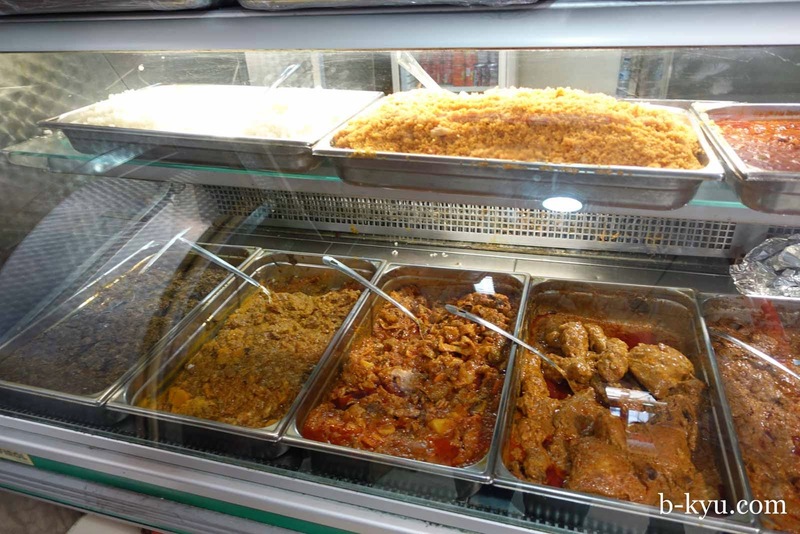 Dishes are pre-cooked, mostly meaty stews plus some grilled kebabs. It's Saturday. It's lunchtime. It's busy. Shawn points at a couple of dishes pretty much at random and gets a chicken stew and a simple veg mix of carrot and cabbage with the odd green olive. The chicken stew is plain but the chicken drumsticks are fried making it rather wazzo. 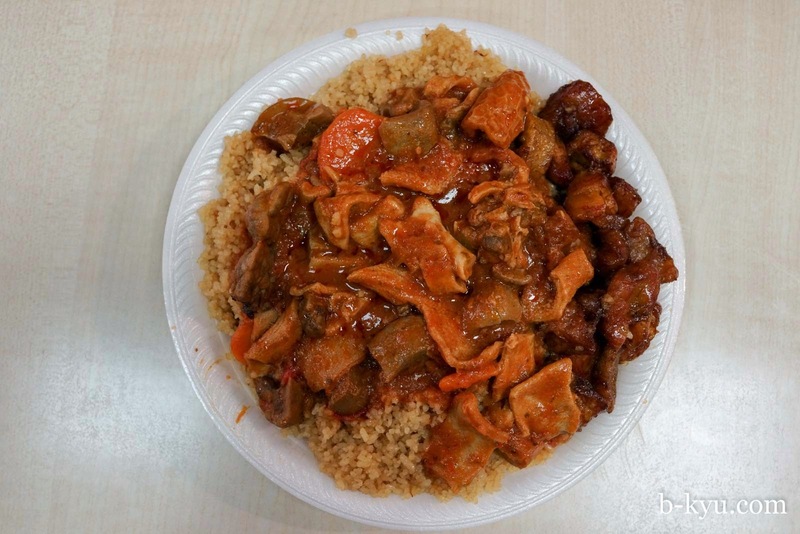 This dish has the red couscous which we assume is flavoured with tomato, it's quite salty. Alison being Alison chooses a tripe stew along with the obligatory banane. The stew is simple and honest and not overly offaly. The plain couscous is less salty than the red couscous and would be our pick. Alison had to insist to the server she wanted to order the tripes, the lady just wasn't sure about it. It was a large and filling feed and the placed oozed atmosphere. We love Dans Best Africa. We're still full hours later so dinner is simply a toasted baguette with French butter, which is certainly something to write home about. 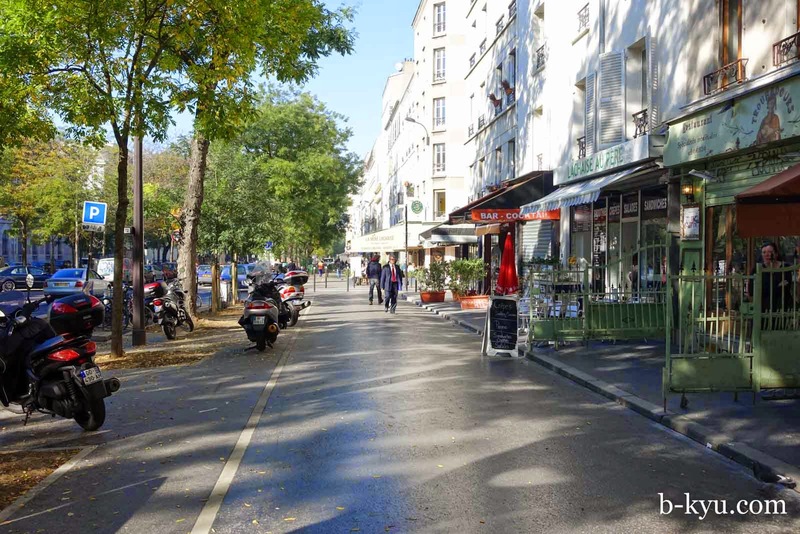 One unseasonally warm and sunny late October day we follow the Canal St Martin outside our apartment, then take a left and follow Canal Saint-Denis to St Denis, a great place to sniff around for African migrant restos. 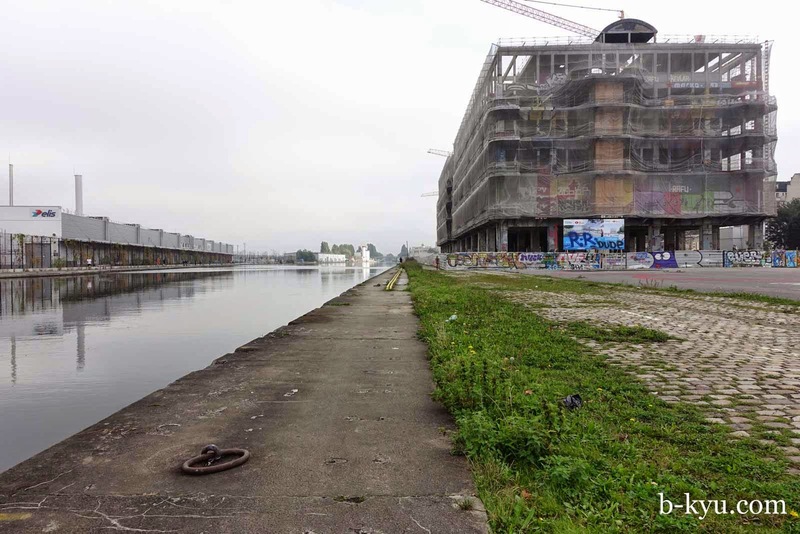 We read this walk is great for checking out urban decay but it is being developed fast. Check out this great three part post on this walk at soundlandscapes.wordpress.com. The walk starts out all lush and newly developed at the St Martin end. 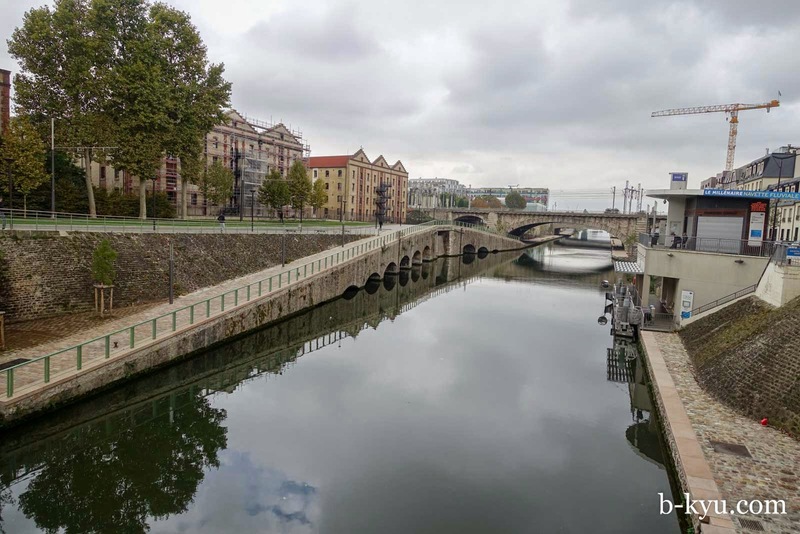 Canal St Martin turns into Canal de l'Ourcq which takes you through entertainment and business areas, cosy suburbia, reclaimed factory areas with some arty farty along the way. 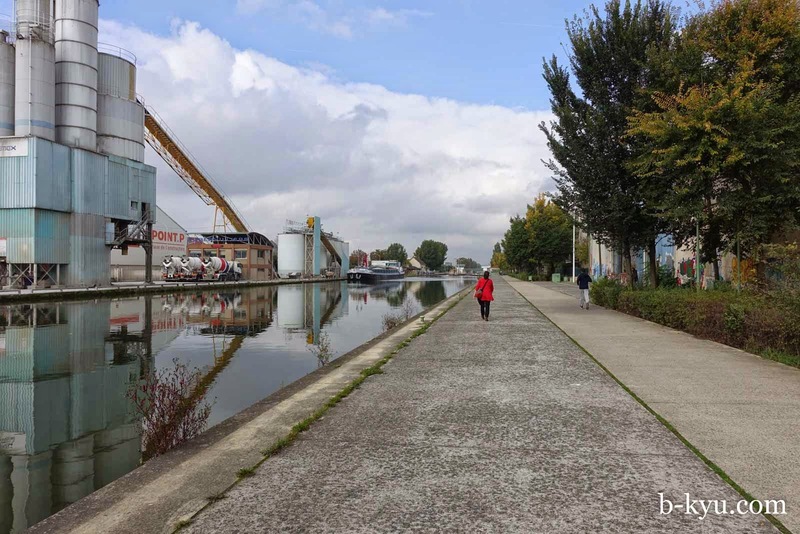 The canal takes us into industrial wasteland, then on to outer surburbs and so on, for another ninety kilometres or so according to the map. We do a u-turn around after a few kms when the crowds of joggers and Sunday strollers thin out and give way to homeless folks and loitering dudes. ...then goes through industry, a bit of decay, and a little bit scary... then gets purdy and nice and treelined again when we reach St Denis. We couldn't believe our luck. 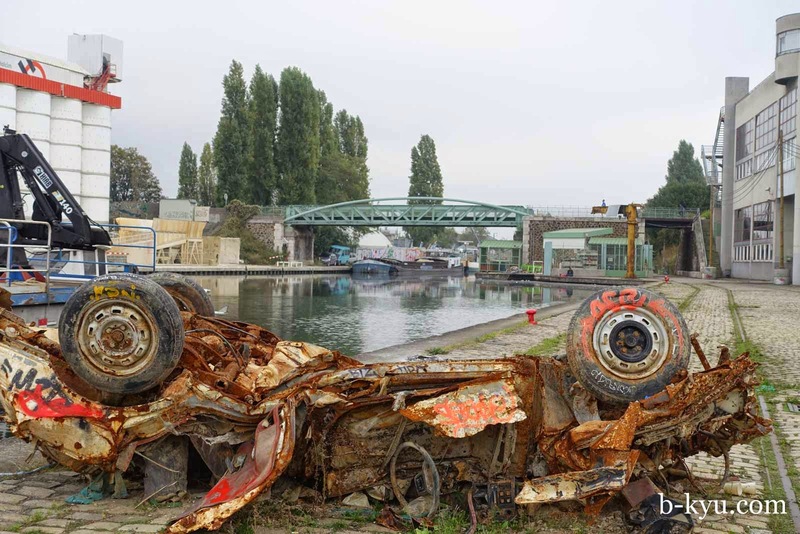 We walked to Saint Denis in hope of an African migrant resto and find a magnificent specimen straight after veering off from the canal around the stadium area. 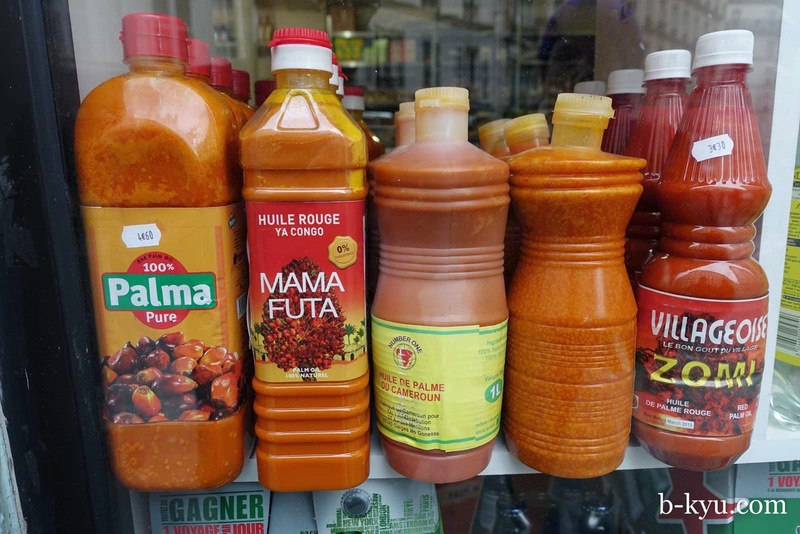 Chez Mama Fanta does food from West Africa. 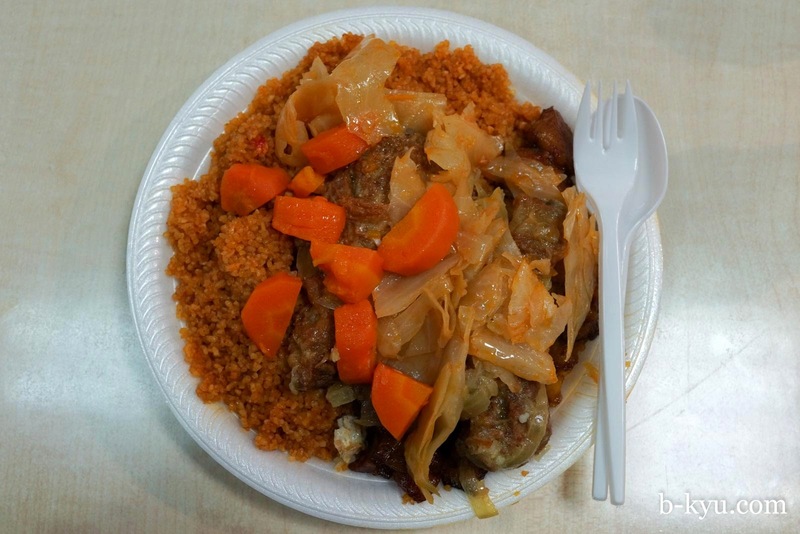 We didn't have the language skills to ask the lovely boss lady where the food was from, but from Googling the dish names it is West African food, the names Ghana and Ivory Coast pop up a lot. 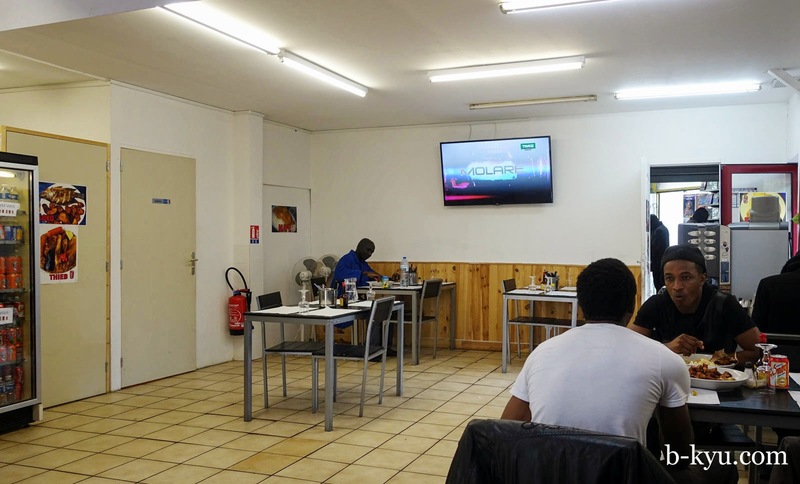 We walked in and it looked ethno-food-nerd-superb: basic with no decorations, apart from two large LCD tvs showing African music videos. 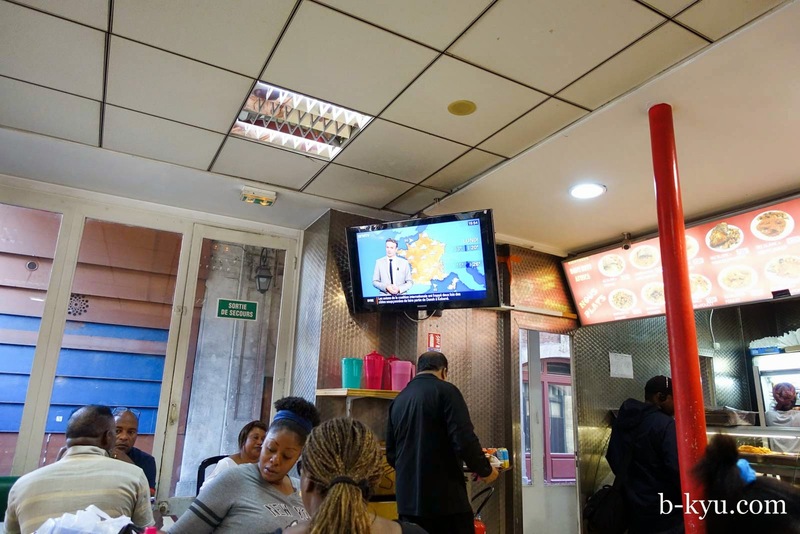 It was all white tiles and white walls with a servery in the corner. Once again we have no idea how or what to order. It was everything we could have hoped for. We blabber some appalling French at the lady behind the counter. She looks at us blankly. We are not sure if she is confused or she doesn't like the look of us. Shawn gives her a big smile and we get a smile in return, it's all good. She zips off to another table to deliver a wonderful looking meal of fish, rice and salad. She returns and we point longingly to the said fish dish and say 'we'll have one of those, mate'. After more smiling, pointing and gibbering we think we've got the order sorted: a fish and rice, and one of those big yellow blobs with some chicken or something. We feel cocky. Then counter lady points next door and says “pay” and we have no idea what to do. She shoos us next door into the adjoining video shop, hair salon and video production company, leaving us with a mystified dude behind the counter. He looks at us blankly. We look at him blankly. We say something like chicken and fish, which in our kindergarten French probably means “pull your pousson, mate”. He has no idea what we are talking about. We might have just called him a fish wanker. Then he figures it out. “Two” he says. We give him some money. We get two tickets. We go back to the nice restaurant counter lady and give her the two tickets. Then we notice all the dishes are six euro, all we had to say was “two”. We feel like dickheads, but we are well used to that by now. The dishes arrive and we don't get the fish and salad. We think that's Shawn's fault, he's a crap mimer (mime is money!). 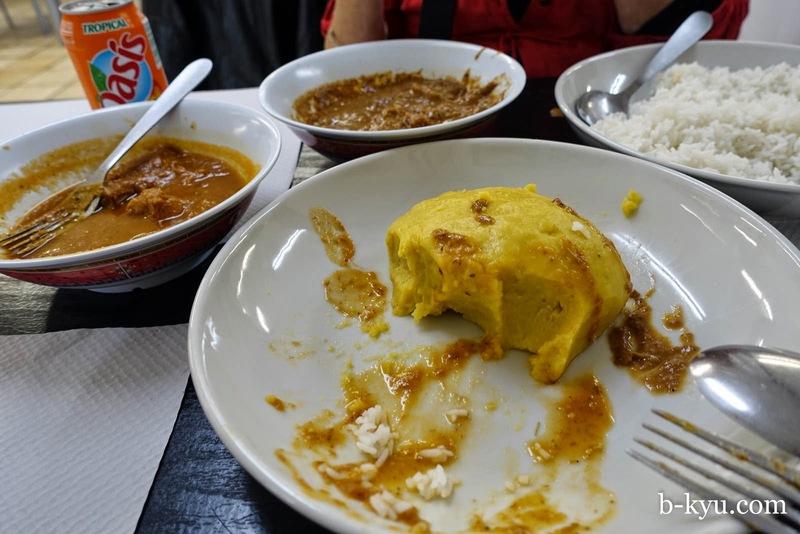 But we get the ball of foutou we so desperately wanted, which is a big ball of stodge made from cassava and plaintains. Shawn is a fan of similar staples from his travels in East Africa many moons ago, but these were made from maize flour and could be quite bland. Foutou has a bit more flavour and is a little sweet. There's also a big plate of plain rice but it's the foutou that excites us. We also get two stews of mystery. 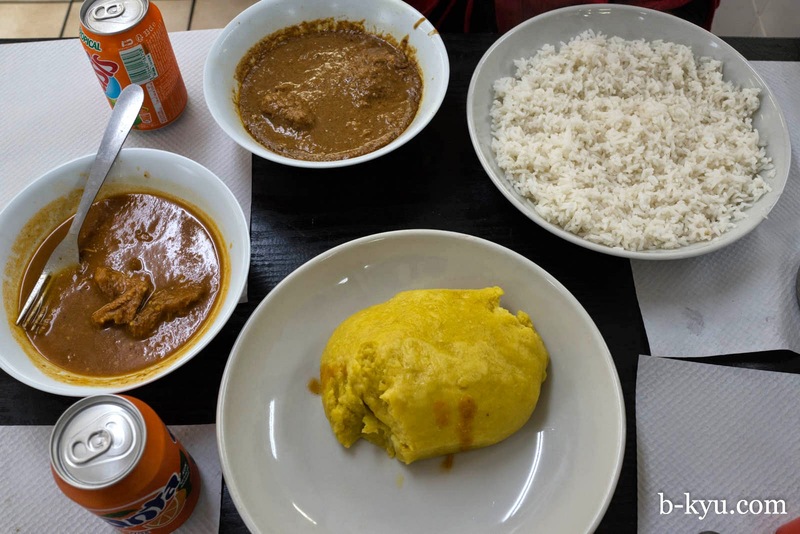 Our tastebuds and Google lead us to believe one of the stews is mafe, a west African classic of meat (beef we think) in a peanut sauce, like a sweet peanuty stew, like when your auntie Beryl makes Malaysian sate from a 1970's Woman's Weekly recipe. It's rich and lardily delicious, so is Beryl. The other stew we figure to be gombos, we tasted tomato and it had a nice mild chili kick. Google tells us it is cooked with tomato, dried chilis, and okra. We're determined not to eat the whole brick of the foutou and we almost succeed. The boss lady comes over a couple of times to give us our free can of Fanta and some water. She asks is if we like the food.“Se bon?”. "Se bon!". We love it. 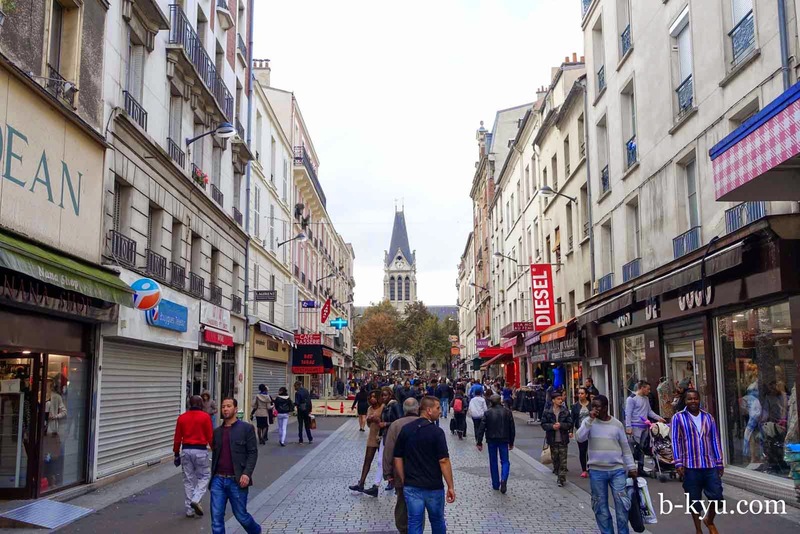 After lunch we walk around St Denis. Most of the shops are shut on a Sunday so the vibe is dead, low rent and a touch edgy. We wish we came back to check it out on a weekday or Saturday. 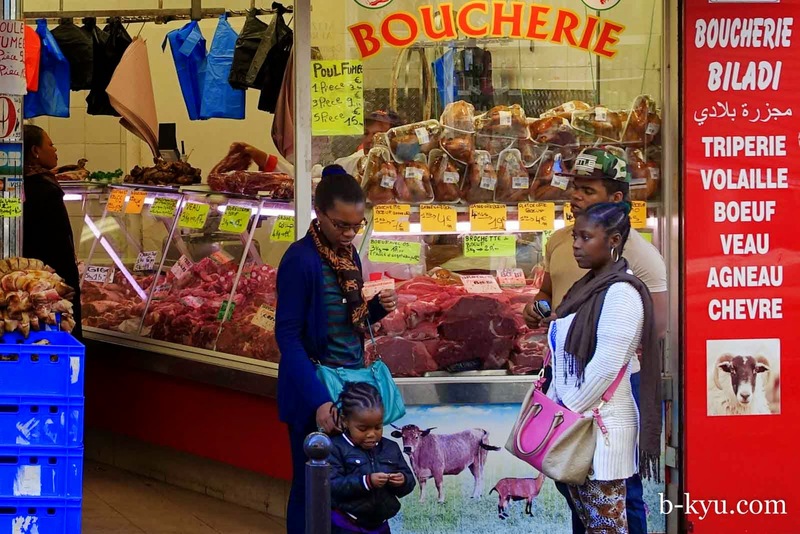 St Denis has a large wet market which reminds us of the zillion wet markets we've seen in Asia, without the stench. But this market is packing up for the day as well, there's just a few stragglers and us. 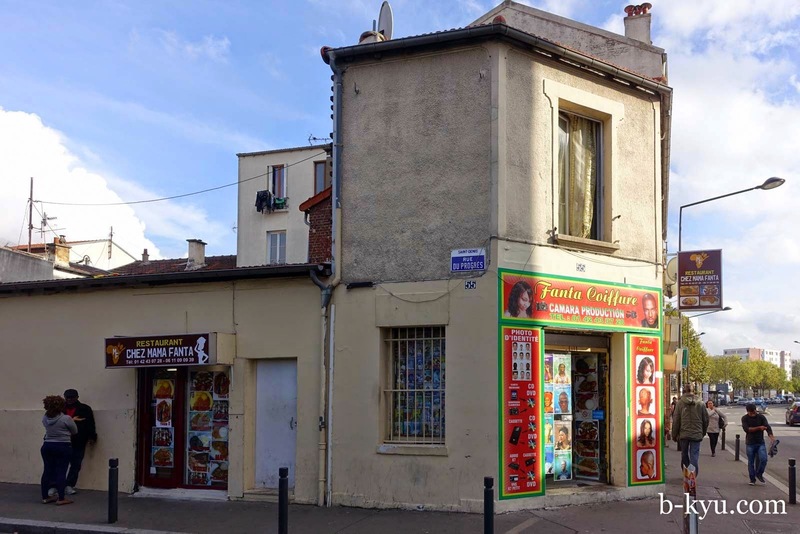 We'd love to see this place in full swing, seemed to have a mix of everything, French, African, the works. Away from the market proper there's a crowded street that seems like an unofficial market with cagey dudes standing around piles of pirate dvds and fake handbags on the ground on blankets. 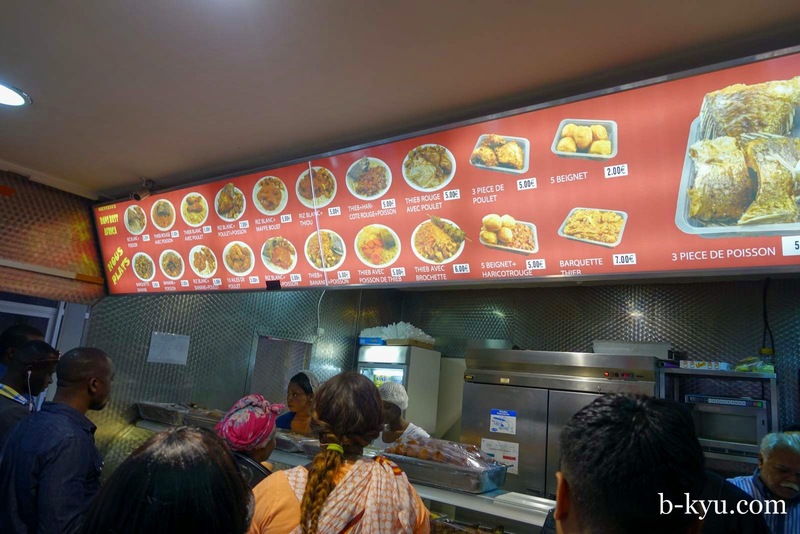 We head for the train station and pass an African restaurant on the way that we'd love to go back to. 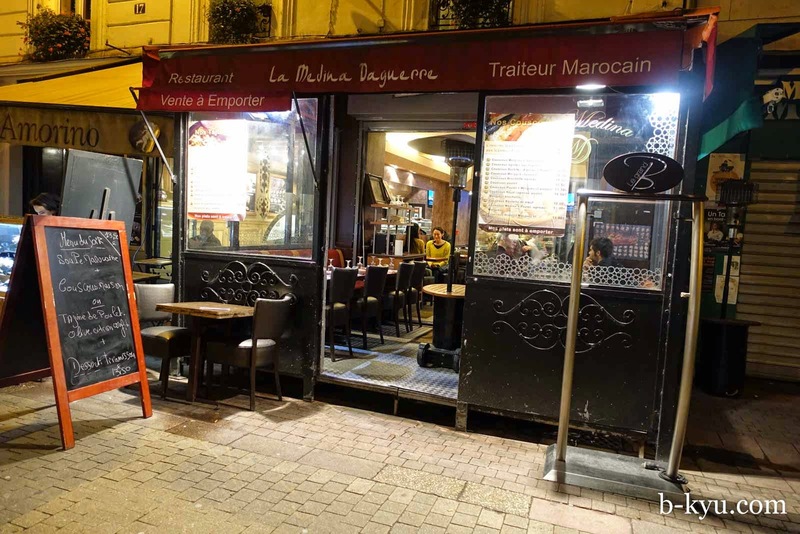 It's like a regular Paris bistro but with an African menu, and we even seen some African diners in there. We hoped to get back to try it but our trip was running short. We catch a train from St Denis to Champ de Elysees. 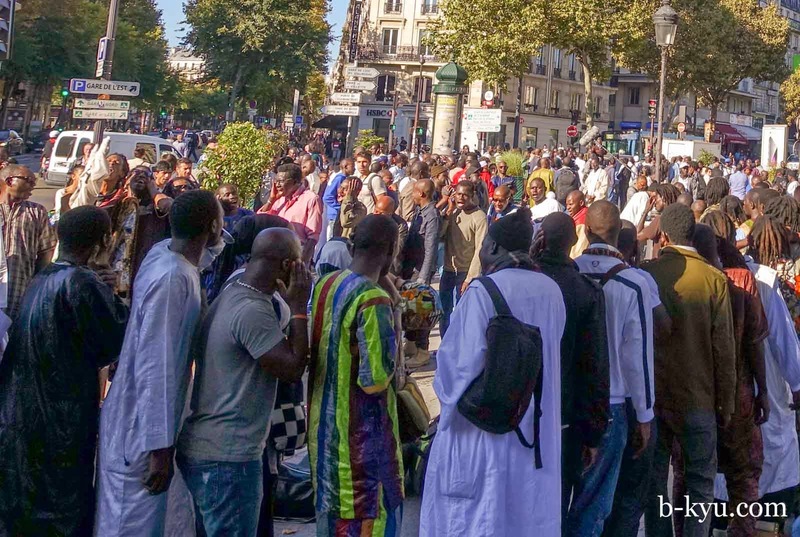 After spending all day in the rougher end of Paris it was surreal popping up from the subway in front of the Grand Palais surrounded by rich tourists, loads of them from the super high end hotels nearby wearing the kind of clothes that cost as much as our whole holiday. 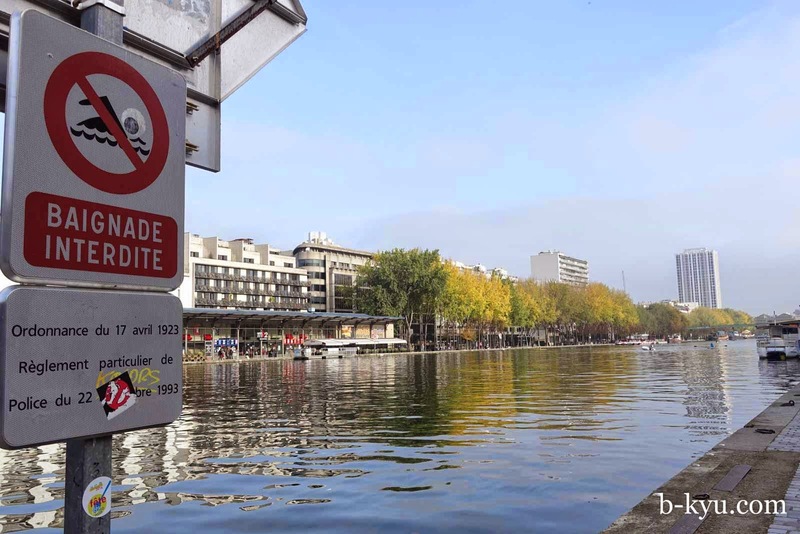 Paris is a city of extremes. 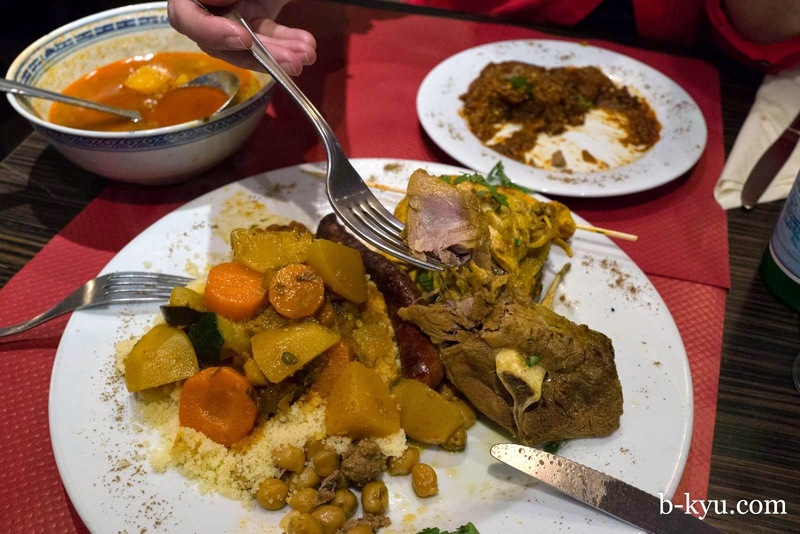 Moroccan food is hugely popular, couscous is pretty much an everyday food. 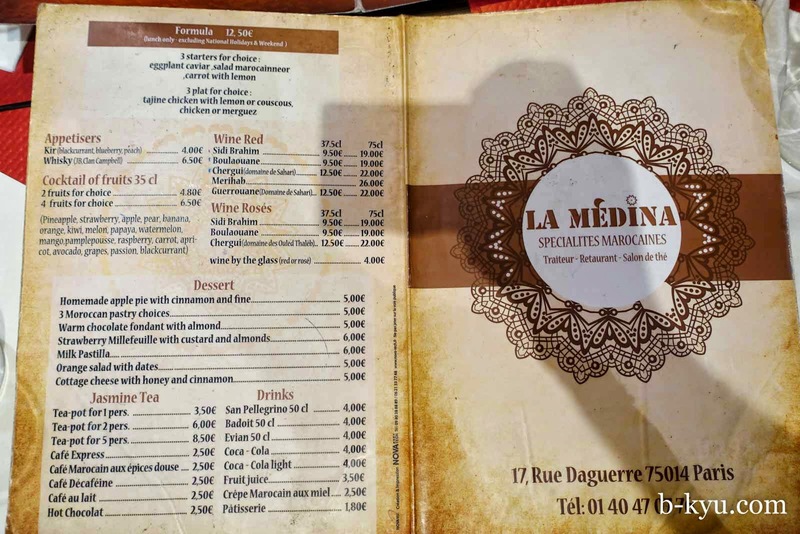 We give it a stab at this suburban Moroccan, Le Medina Daguerre, on Rue Daguerre, and awesome little pedestrian strip of shops near Montparnasse. 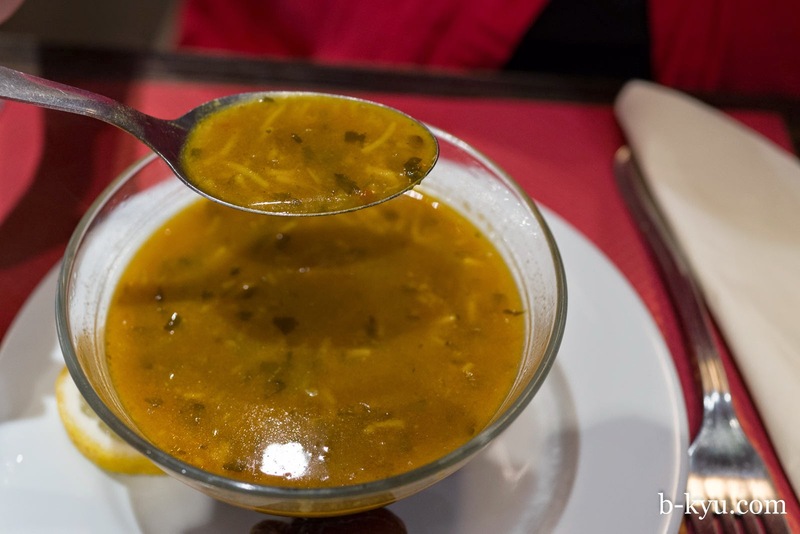 Moroccan soup is great, like a mild runny curry. Eggplant caviar with olive oil and kefta, which we learn has nothing to do with fish eggs, and lots to do with a lovely eggplanty moosh and a couple of crunchy samosa type things. We order couscous royale because it rolls off the tongue like a Royale with Cheese ala Pulp Fiction. There's a pitcher's mound of couscous that's much finer than the couscous we've had in australia. The plate is piled with protein including a rissole, a big hunk of tender slow cooked mutton, mergez sausage (the highlight of the protein, spicy like chorizo), a hunk of turmeric yellow chook that's mighty dry in the outer fleshy bits but lovely and moist around the bones, some chick peas and raisins. On the side is a hearty bowl of vegies in a mild broth which we are instructed to pour over the couscous. Its not an amazing meal but it's hearty and carby and comforting with plenty of fluid and veggies, and lowish in fat for a change. We can see why its so popular, if we lived here we'd eat this a lot, especially in winter. We laugh at ourselves because we realize we'd love the food more if it was served in some dingy hole-in-the-wall in a sketchy neighbourhood rather than this nice suburban whitey restaurant in a nice whitey area. We can be such inverse snobby wankers at times. 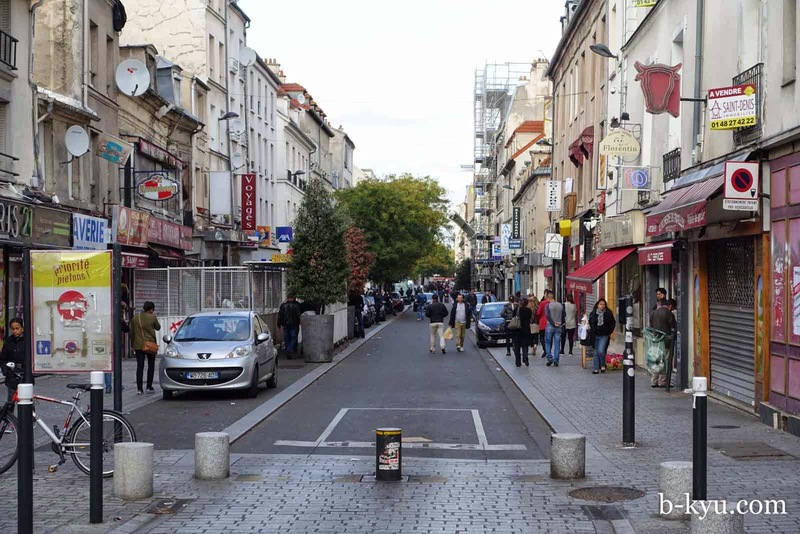 Meanwhile, in the eastern part of Pairs, head half a block in any direction from Belleville Metro station and the streets quickly become less Chinatown and more every-man-and-his-dog-town. There's folks from all over the world in this neighbourhood, every race, creed and colour. 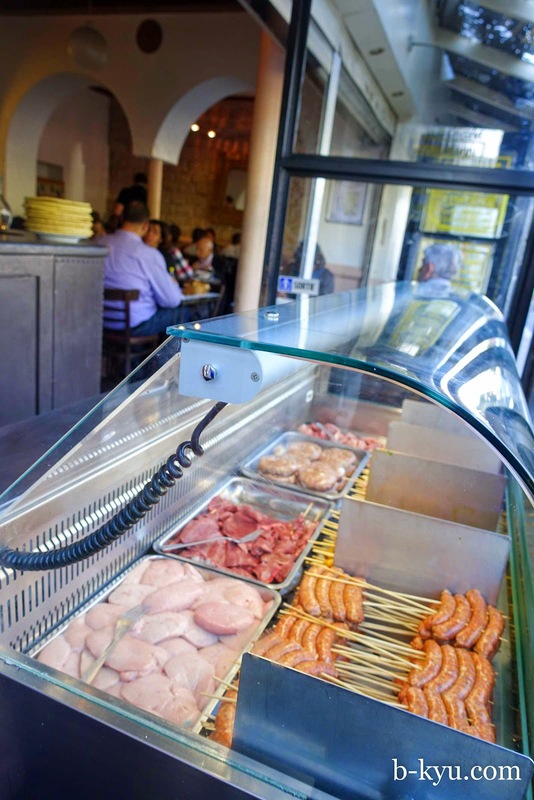 Belleville is one of those spots where Jewish and Muslim communities live and work side by side, see this article here. We love how there's an even mix of everybody here. Cheap rent brings in students and arty folks giving the place a great vibe. 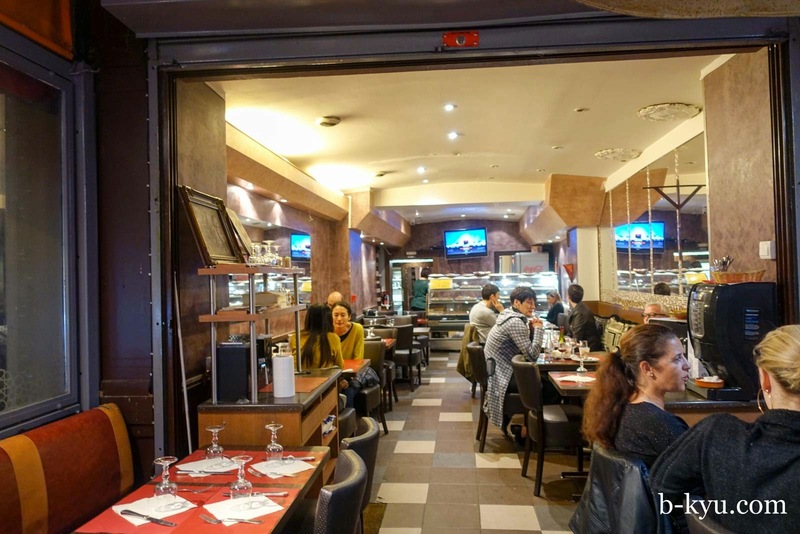 We love all the great little bars and Tabacs full of old men from everywhere, and wonder why the heck we love bars full of old men so much, we seek them out in Sydney as well. 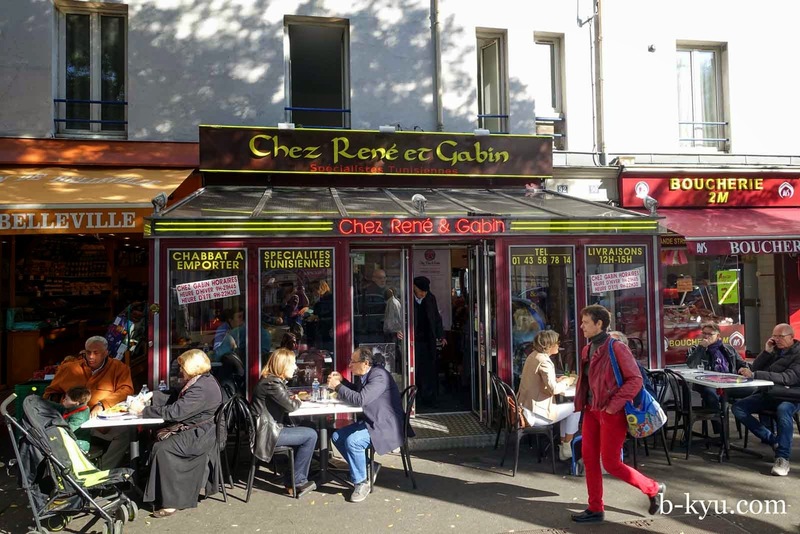 The restaurant is Chez Rene et Gabin on Boulevard de Belleville, and it's pretty popular. 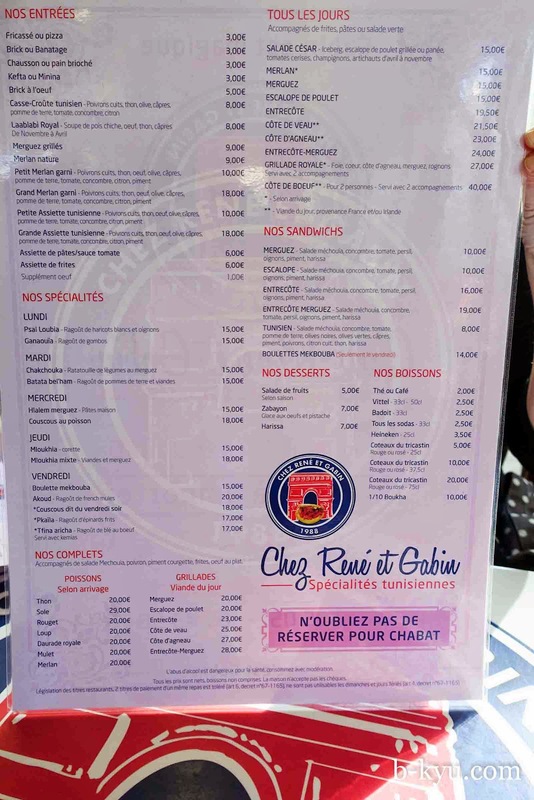 Chez Rene et Gabin menu. 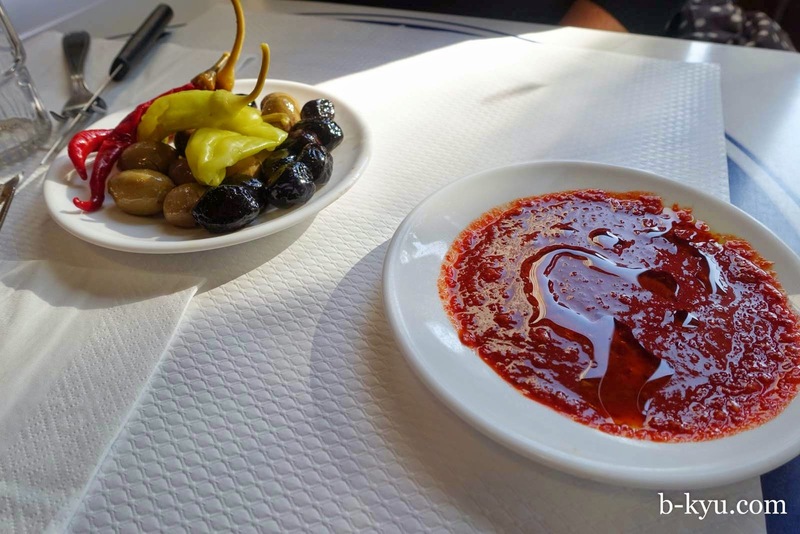 First we are presented with dishes of harrisa and pickled chilis and olives. Man we love harrisa. We order a random snacky for entree that we see on a fellow diner's plate. 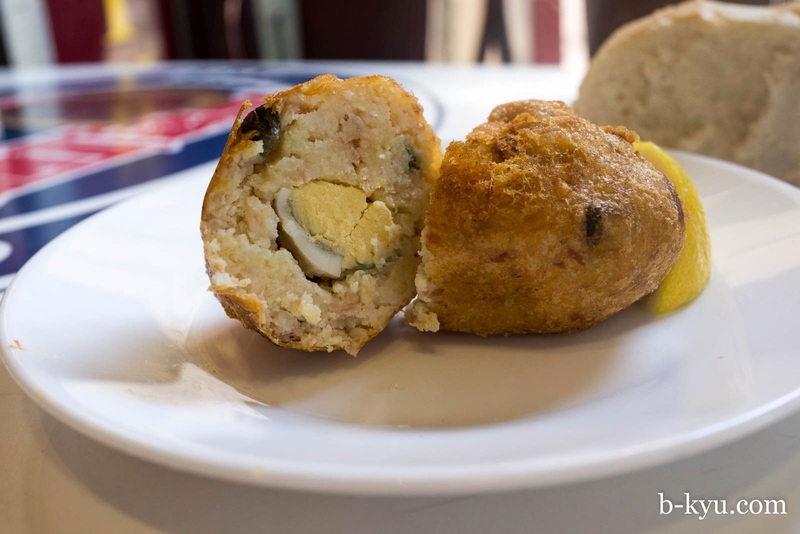 This mystery brown ball turns out to be a deep fried tuna and mashed potato pattie, with a boiled egg inside. “Good luck” says the waiter as he delivered Shawn's Tunisien sandwich, it's huge. The roll is light and crisp on the outside, similar to a roll you would get from a Vietnamese baker in Australia. 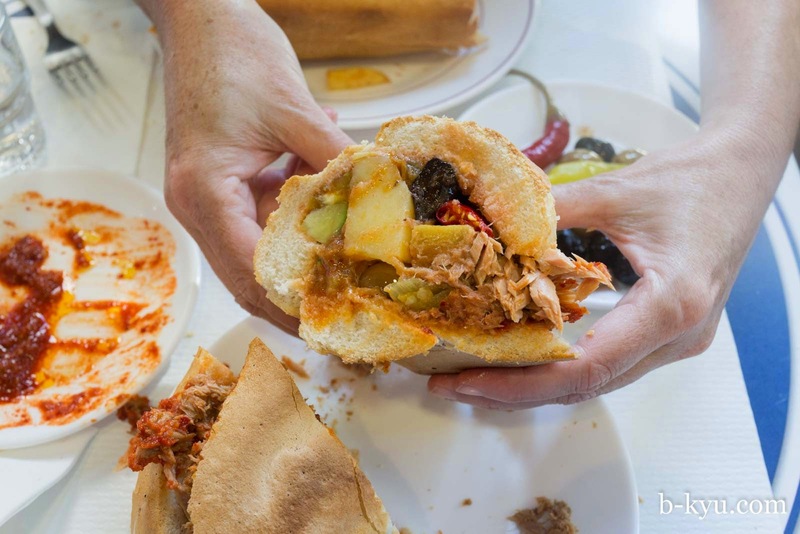 It's piled high with tinned tuna and given a lift with pickled chilli, olives, chopped cucumber and tomato, spicy harrisa and we're not sure what else. It's delicious and seems to be related to the little tuna and olive rolls we had in an Israeli joint earlier in the trip. 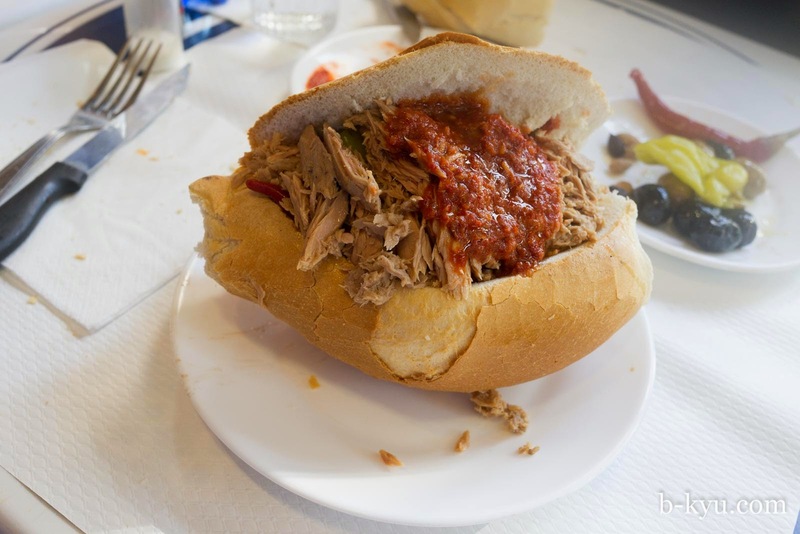 The sandwich was easier to eat with a fork, scooping out the goodies and leaving the magical flavour soaked bread to the end. The punchline is that we thought we would have a light lunch. Man, we rolled out of there. We walk around the area some more, until it meets the more gentrified areas like Oberkampf and Menilmontant, where we saw the happiest dog in the world. Along the way we met this super friendly shop cat who ran over for a pat, despite clearly not being an athlete. We were giving him the full double head scratch and he's loving it to bits. Then the shop owner comes over and rouses on the cat, then kicks the cat until he goes back to his designated spot under a table. "What an a-hole" we think. 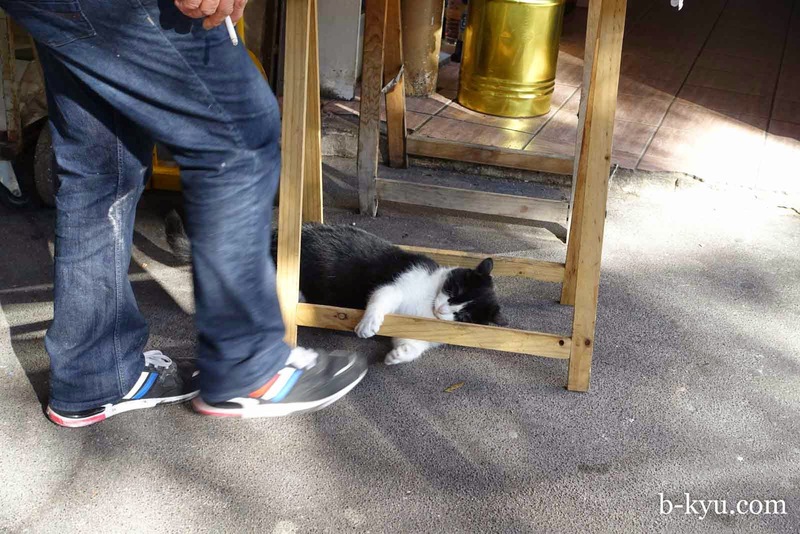 Then the shop owner and shop cat play a happy game of footsy/swipety. They are still playing when we turn around the to look a couple of minutes up the street. All is forgiven. 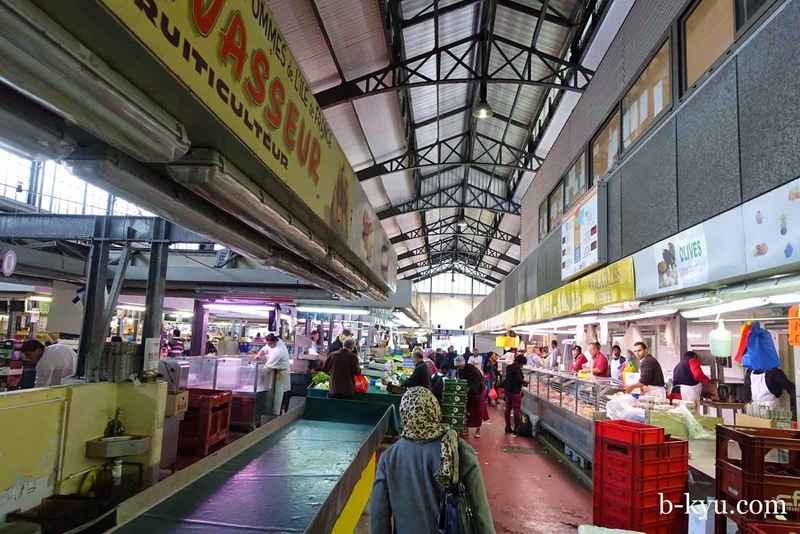 As we wander around we notice some more great looking Tunisian and Moroccan places, some of them where you can pick out your own meat. On later reading we discover we should also be looking for Berber food. 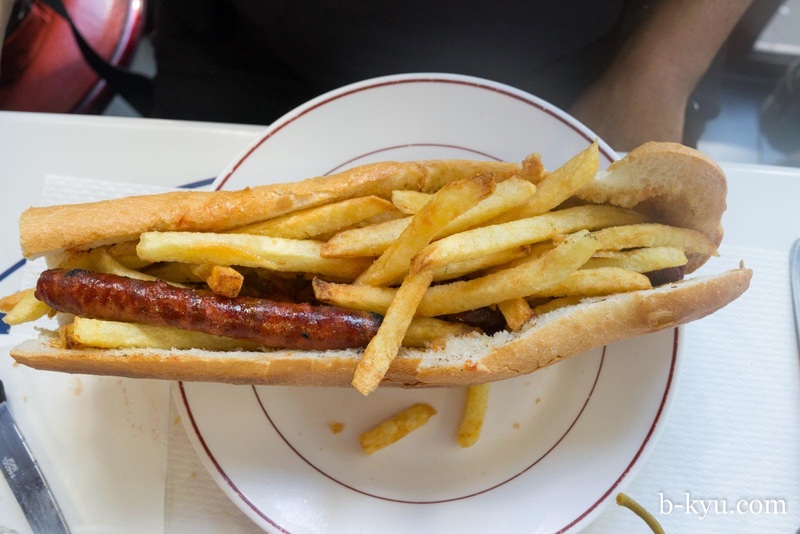 A month's eating in Paris barely nicks the surface. In Sydney we are Asian food nerds but if we lived here we would definitely become North African food nerds as well. Hi! i just rode your article, sent by a friend of mine. next time you'll be in paris, contact me :) !! but it's very nice from you to visit cities like this. your blog is rich and interesting.